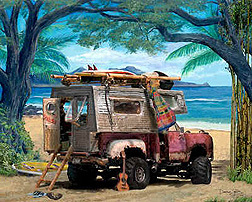 Cruiser Art is the proud creation of two long-time friends, Maui artist Darshan Zenith and Maui businessman Steve Rummel. 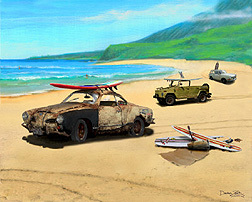 Together they have created and perfected a unique art form that combines the best of automotive art, surfing art and Hawaiian art. 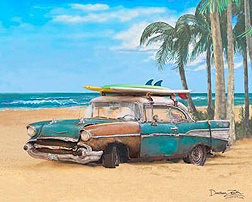 Although some customers focus on only one aspect of the art (such as the make of the car), fans agree that Cruiser Art is definitely greater than the sum of the individual subject areas it portrays. Born in Chicago, Darshan Zenith moved to Santa Monica, California when he was four. "I used to ride my bike over to the beach every day after school. Even as a child I felt as if I was somehow being inexplicably drawn to the sea." 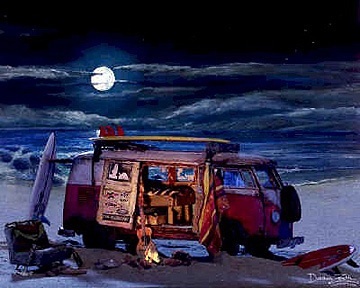 Few know life on the beach, surfing and the ever present Cruiser parked at water's edge better than Darshan. No one presents it more authentically. 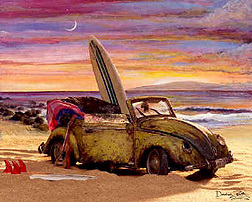 "As a kid I can remember going to the beach and seeing many of the very same cars I now paint. Of course that was fifty years ago when they were still shiny and new -- long before they rusted out and evolved into cruisers! I can also remember seeing Model A Fords and other cars of that era which were the cruisers of the fifties. Even then I knew they were special." Now half a century later, world traveler Darshan reports, "Every beach I've ever visited anywhere in the world has at least one rusted-out cruiser on it -- guaranteed!" Darshan's diverse credentials extend far beyond canvas and brush. His art has included designing and building special effects models for movies, television and commercials. Museum art has also been one of Darshan's lifelong interests. Darshan has worked with a number of museums in various capacities. Among others he consulted on the planning of the Lake Elsinore (California) Museum and designed, constructed and painted many of the museum's backdrops. One of Darshan's most interesting "non-beach" art experiences came while living in the Gold Rush country of Northern California. To attract tourism several small towns in the area refashioned their Main Streets with Old West building facades and storefronts. Darshan played an active role in several of these communities. "I especially enjoyed researching the historical signage and then painting storefront banners to look as if they had weathered the elements for a hundred years. With Cruisers I only have to add fifty years of exposure to the elements -- however I have the additional challenge of adding fifty years of wear and tear by mankind behind the wheel!" In 1990 Darshan's life took a fateful turn. 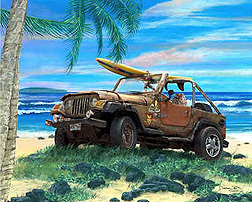 By pure happenstance (known locally as "Maui Magic") he and Steve met and Cruiser Art was born. 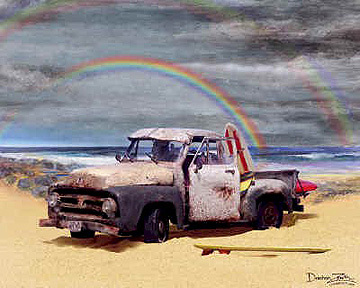 "In many ways Cruiser Art is the culmination of all that has come before -- both my life on the beach and my life as an artist. In every respect it is my proudest work". Darshan adds, "My real gratification comes from knowing I have offered an art form that people find fun and that evokes a very real happy feeling. 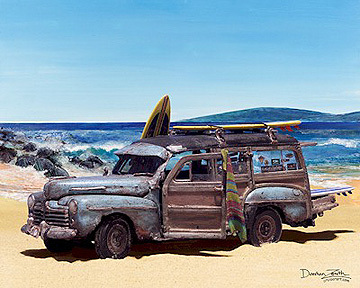 Cruiser Art is 'feel good' art. 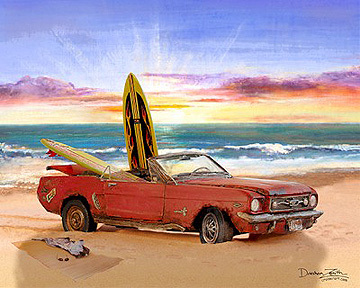 Cruiser Art evokes a positive, happy response -- most often an audible 'neat' or 'cool' or sometimes 'awesome! '"..